Another root beer in a clear glass bottle; the initial impression of the Kutztown Root Beer Review. 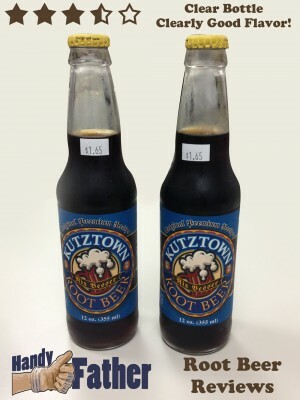 Kutztown root beer has Yucca Extract as the primary flavor ingredient. It produces a pleasant licorice flavor. We poured some Kutztown Root Beer into a frosted mug to find an interesting reddish-brown head, not too much, but it was good. There is a slight bite, but goes down nicely. I’d definitely consider a Kutztown root beer when available. It is a quality brew. A nice thing about this Kutztown, Pa. brew is that it’s made with pure cane sugar. It is a good straightforward root beer. We gave the Kutztown Root Beer review a score of 3.25 out of 5. Many of the root beer reviews we have done at Handy Father Root Beer Reviews have been better than this one, but plenty have been worse! !